Home / BCT News / Prefabulous! Wake Green Road in Moseley will always be a little bit forever 1945. There, backing on to the Shire Country Park, can be found a time capsule row of 1940’s prefabricated houses. Externally time pauses at the south end of the road as 17 prefabs stand in line with a row of front gardens and matching cottage style design. Built in 1945 by mass builders Laing, McAlpine and Henry Boot, the Phoenix model prefabs were erected as a result of the 1944 Housing (Temporary Accommodation) Act. A halt to slum clearance and the Second World War blitz on Britain’s second industrial city left many properties uninhabitable and new housing was needed fast. The Total War economy meant traditional materials were in short supply and tradesmen were in uniform. Prefabricated houses which could be quickly and easily erected using factories geared up for wartime production. As the act suggests, these houses were intended as temporary solutions to the housing problem and though only envisaged to last for 10 – 15 years, many all around the UK have stood the test of time a lot longer. In Moseley they still stand proud more than 70 years on. Appearances can be deceiving and for some it’s more about being able to keep standing at all. Of the 17 bungalows, 6 lie empty, 10 are occupied by Birmingham City Council tenants and one is privately owned. In 1998 the value of these buildings was formally recognised when 16 of them were given Grade II listed status by Historic England. More than 100,000 prefab houses were built after the war and over 4,000 in Birmingham but those remaining are considerably depleted that the Wake Green Road prefabs have national significance as well as embodying the memories of many Brummies. For the first families who moved in to the bungalows they represented the height of luxury with refrigerators, fitted kitchens, hot air central heating, indoor toilets and private gardens. Each building matched its neighbour following the 32’4” x 21’3” footprint with lounge, kitchen, two bedrooms, bathroom and separate lavatory. The kitchen and bathroom were placed back-to-back to allow the pipes to be concealed. Each building was finished in magnolia paint with green gloss trimming, featured a panelled timber front door, slightly pitched roof and had its own garden shed. Many of the bungalows retain original features such as built-in cupboards in kitchens and bedrooms, mantelpieces (although many original fire places have gone), panelled walls and original bathroom suites. 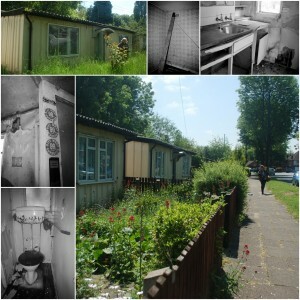 Unfortunately the years have not been kind to the prefabs and many suffer from damp and decay. Minimal repairs over the years have kept most of the buildings in habitable condition and a great deal of work is now needed if they are to survive another 70 years. As part of the Conservation of the Historic Environment course at Birmingham City University, 20th century heritage specialist Lou Robson prepared a Conservation Plan for Birmingham Conservation Trust, which places the prefabs in their historic context whilst looking at what the future might hold. Four possible futures are proposed and the favoured one, supported by Historic England, would see Birmingham Conservation Trust taking on the six empty prefabs and undertaking an informed conservation restoration to enable them to be used as holiday lets with periodic public openings as museums and activities. We will be working with The Prefab Museum (www.prefabmuseum.uk) which has been archiving the history of prefabs and their inhabitants for the past decade. The current tenants speak fondly of their homes and community, and there is a strong feeling of nostalgia and love for these temporary homes by the generation who experienced the post-war years and their descendants. We want to enlist this passion to help us secure a future for this important group of buildings which symbolise war-time endurance, design in the service of the people and hope for a brighter future. We are hoping to be able to get permission to open the prefabs to the public as part of this year’s Heritage Open Days and Birmingham Heritage Week; so watch this space for further details. I lived in a prefab, in Middlesbrough, from 1952-62. They were imported from the USA or Canada at the end of the war. Lots of the tenants were, like my parents, ex services, with young children, who had previously lived with their parents in cramped accommodation. When I recently made contact with an old primary school pal (we’re now both retired) he immediately recalled having iced lollies at our prefab. We were the only family he knew who had a fridge, yet I took it for granted as one was built onto the kitchen units. When the prefabs were pulled down in the 1960s we were moved to another council house, but were then without a fridge for a few years. That felt really strange. One feature of the Middlesbrough prefabs, shared with those on Billesley Lane, adjacent to the golf course, in the late 1970s was the use of surface level Anderson Sheltered as coal houses/sheds. Must check to see whether they’ve survived on WakeGreen Road. Good luck in arranging an open day. Thanks for sharing your great prefab memories. The prefabs on Wake Green Road do have the original sheds but they are not Anderson shelters. Hopefully you will be able to see in one if we are able to arrange the open day.